Oxnard, CA – [Sept 14, 2015] Oxnard College Institute for Latino Performing Arts will present its second performance of Latino Thought Makers at Oxnard College Performing Arts Center on Thursday, September 24 at 6:30pm. The live show, hosted by comedian Rick Najera, will feature Mexico’s most beloved host Marco Antonio Regil and Hollywood stand-up comedy producer Scott Montoya. Entrance to the event is free. In its third season, Latino Thought Makers Series, hosted by Hollywood award-winning writer-director-producer-speaker and comedian Rick Najera, is an important initiative designed to engage, educate and entertain students of Oxnard College, the city of Oxnard and greater Ventura County communities. The successful series has showcased the careers of the most prominent Latinos in Hollywood including actors Edward James Olmos, Esai Morales, the family of Cesar Chavez, the creator and cast of Hulu’s East Los High and more. All performances are free (unless otherwise noted) and open to the public. Special guests featured on September 24 include Marco Antonio Regil, the star of 100 Latinos Dijeron (Family Feud) airing weeknights on MundoMax, and is also the longstanding host of the Latino versions of hit game shows like The Price is Right, Dancing with the Stars, Minute to Win It and Are You Smarter Than A Fifth Grader. Regil’s high-profile work also includes hosting National Telethon for over 15 years, raising more than $500 million dollars. The event will also showcase the career of Scott Montoya, CEO of lolflix Inc. who has directed and produced more than 80 stand-up comedy specials for network broadcast (Showtime, Comedy Central). Montoya has worked with hundreds of top comedians in Hollywood including Cheech Marin, Tommy Chong and Snoop Dog. Some of Montoya’s productions include The Original Latin Kings of Comedy, The Payaso Comedy Slam, The Original Latin Divas of Comedy and Alex Reymundo’s Hick-Spanick, for which he won an Alma Award.” Montoya, also the founder and director of the Santa Barbara LOL Comedy Festival (formerly the LOL Comedy Festival), will present the 7th Annual SBLOLFEST October 8 – 17th (sblolfest.com). 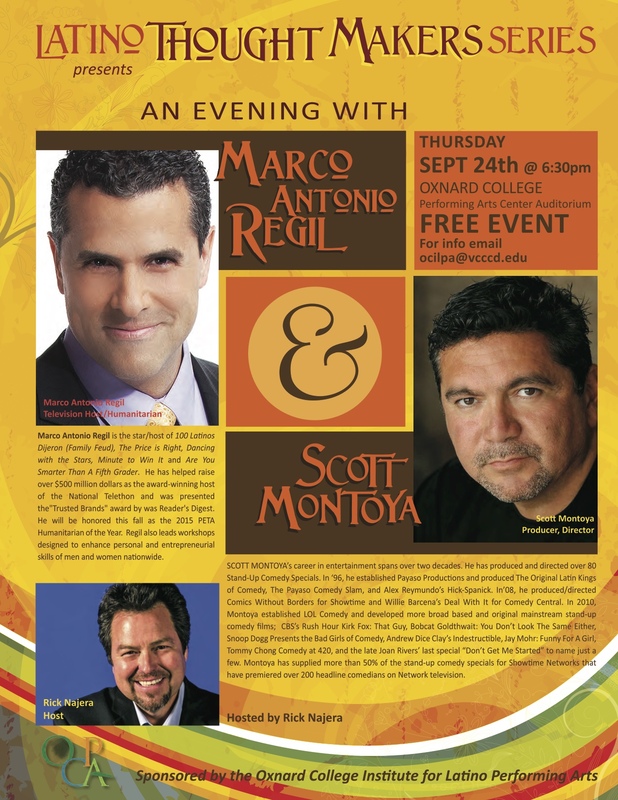 Oxnard College Institute for Latino Performing Arts presents Latino Thought Makers live hosted by Rick Najera featuring guests Marco Antonio Regil and Scott Montoya on Thursday, Sept 24 at 6:30pm at Oxnard College Performing Arts Center, 4000 S. Rose Ave, Oxnard, CA 93033. Entrance and parking are free. RSVP to ocilpa@vcccd.edu for best seats. For more information on Oxnard College Performing Arts Center, visit http://www.oxnardcollege.edu/academic/departments/oxnard-college-arts or Facebook at https://www.facebook.com/OCPAC.